Winter is here and it is a great time to make sure you are in the best possible cycling position. Get in touch with Star Physio to take advantage of this great offer with a bikefit using Perth’s only saddle pressure stability system to find your ideal cycling position. Whether you need a bikefit because of pain or injury, for comfort, or because you are chasing a PB or world record, our expert physiotherapists using the gebiomized bikefit system can help you! During Winter, Star Physio has a special offer with all bikefits to include a saddle pressure and stability assessment at no extra charge. This is usually an additional $100 over out usual fitting fee, but over winter, we will offer it for free! Check out the different bikefit services we have available here http://starphysiowa.com.au/bikefit2/bikefit-services/ or give us a call for more information. Research has now proven that measurements of knee angle are very unreliable in determining ideal bikefit and KOPS or knee over pedal spindle is invalid as a determinant of a good cycling position, despite these two measures previously being the “gold standard” in bikefit around the world, and still being used in most bikefitting systems including Retul and GB fit. Star Physio’s principal physiotherapist Damian Oldmeadow lectures nationally and internationally on the subject of cycling injuries and bikefit and has over 20 years of experience in the area. As part of his National Series of Lectures for Physiotherapists on Bikefit and Cycling Injuries, he has undertaken a detailed review of the available research in to traditional bikefit with surprising results for many! Knee angle measurement, even with experienced physiotherapists and bikefit specialists has been found to be inaccurate by 10 to 15 degrees, and research is yet to prove which actual knee angle is the ideal one to ride in regardless! “We spent many years trying to find 1 and 2 degree changes in position, thinking we were making a reliable difference as we measured. We now know that this was not the case, but thankfully we have better technology and research to back up its use!” Sadly, many bikefitters are unaware of this information or chose to ignore it and continue to charge clients for sub-optimal fits. Our saddle pressure analysis helps us determine an optimal position by showing a stable pelvis under load. Our experience is that most of the cyclists we “re-fit” after previously being fitted with traditional methods are actually cycling with their saddles too high, leading to inefficient cycling, poor power at the bottom of the pedal stroke and increased risk of injury such as knee pain and lower back pain. The other classic measurement tool used in bikefit for many years was the humble plumbob, superseded by lasers and digital measures as used in Retul and BG fit systems and their counterparts in place of the plumbob. These give us an indication of how far forward or back on the bike a cyclist is and we used to believe it was an important indicator of correct bikefit position, and in particular we were concerned that there was an increased risk of knee pain and injury if we moved forward of this magical “KOPS” position. We now understand that the research was flawed and that although KOPS still is of some interest, it does not assist up in determining the ideal cycling position and we can also be very confident in moving well outside of this range without fear of injury. Check out the above pick of Patrick Lange and see if you can work out how far forward of KOPS he is?! It didn’t stop him winning a World Championship anyway! 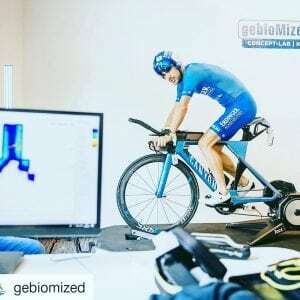 Once again the gebiomized saddle pressure analysis system shows us exactly where the cyclist is sitting on the saddle and how any change in bike position influence load, pressure and stability. More and more of the best cyclists and triathletes in the world are now using this system for their performance and aero fitting, including Patrick Lange, Jan Frodeno, Trek Segafredo, Orica Green-Edge and many more! Come and experience the difference using valid and accurate bikefitting assessments and parameters by getting in touch with Star Physio today! Call us on 92124254 or fill out the form today!